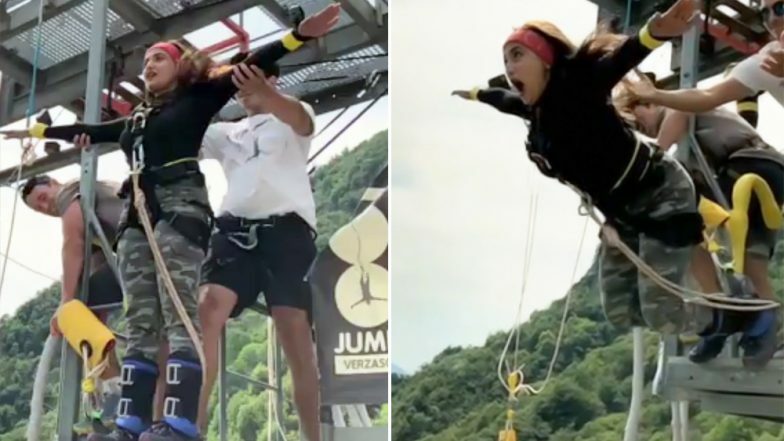 Monali Thakur's Bungee Jumping Slow-Mo Video Will Give You An Instant Dose Of Thrills! Let's keep her Moh Moh Ke Dhaage and Sawar Loon credentials aside for the time being! This is about meeting the adventure junkie in her. Yes, the popular singer Monali Thakur shows us, probably for the first time ever, that she enjoys an adrenaline rush as much as she loves stretching her gifted vocal chords to sensational effects. Here is the 33-year-old seen jumping off the cliff which is touted to be the highest bungee jumping point. The best part about this video is the slow mo in action as Monali takes that leap of faith and dives straight into the valley. This video inject you with thrills and you too would want to strike this adventure off your bucket list! Thakur took to Instagram to make her fans go-lookhh at that! "The first jump and the second highest in the world if am not mistaken..!! Yessss.. fighting all my fears one at a time..;) 👻✌🏻✊🏻🧗🏻‍♀️🏔 Have you guys ever had a thrill that you cannot forget?," she stated. Monali, fans must note, made her Bollywood debut in Nagesh Kukunoor's Lakshmi in 2014. and now She will be seen in Abbas Tyrewala's multistarrer Mango, apart from hosting reality shows and her regular singing assignments!